What are These White Larvae on My Fruit Trees? Home > Ask Our Experts > What are These White Larvae on My Fruit Trees? I have just transferred a dwarf plum tree from one barrow to another (larger) one. When watering the surface, white lavae 8-5 mm long were washed to the surface. On further inspection there were "tunnels" to be found at the surface. These went into the upper root area for about 45-60 mm. What are these white larvae and how do I get rid of them? It sounds as if you’ve got a case of vine weevil – and since you don’t describe any serious problems with the dwarf plum tree you’ve just moved, it looks like you’ve caught the little blighters just in time! The adults are black beetles and are often found lumbering across the foliage of plants; although they do a bit of damage to leaves, they tend to make an unsightly mess rather than causing much harm. The larvae, on the other hand, are a much more serious problem and can decimate a wide range of plants, especially ones grown in pots or containers, and particularly those in compost rather than soil. They eat into roots and tubers of herbaceous plants and can attack woody shrubs and trees too. 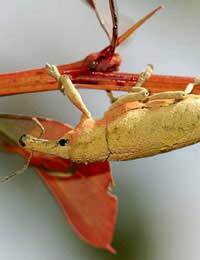 The first signs of a vine weevil problem are usually yellowing leaves, wilting and poor growth – and all-too-often, once you’ve noticed them, it’s too late. From what you’ve said it looks as if you’ve got a bit of time to deal with the infestation, but time is off the essence. The size of grub you describe suggests that they haven’t long hatched; normally the larvae are 10 – 12mm in length, so at 8.5mm, they sound as if they’ve got some growing to do – but then, of course, they’re planning to do it at the expense of your tree! Timely treatment is called for, and there are several ways to deal with the problem and try to make sure it doesn’t flare up again. For many plants, the first option is to use a specially formulated systemic insecticide intended for the purpose, but this probably isn’t going to work for you – at least not if you intend to eat the fruit – since you can’t use these chemicals on root vegetables or edible crops. Fortunately, there are excellent biological controls available to deal with the larvae which you can safely use on your fruit trees, since the nematode worms involved only target vine weevil grubs and are entirely harmless to everything else – yourself included! Many garden centres stock these products, but if you can’t find them locally, there are plenty of mail order and on-line suppliers to try. Alternatively, for really heavy infestations that are causing severe damage, some gardeners recommend gently washing off the compost as the way to make sure you remove all of them along with any un-hatched eggs. It’s probably a bit drastic in your case – especially since the tree’s in active growth and not currently showing any actual signs of wilting – but it’s something to be aware of in case you’re ever faced with a plant that does need immediate treatment if it’s going to stand a chance of survival. One idea that might be worth thinking about for the long term, especially if this turns into a persistent nuisance with anything in the garden, is to grow plants such as cyclamen or polyanthus that are particularly attractive to the adult weevils. On first sight, it might seem a bit of a crazy idea to go out of your way to cater for these pests, but there is some sound sense to it. Grow these flowers in one of the new generation of plant protection composts – they contain a long-acting insecticide – and when the adults are drawn to your “sacrificial” plants and lay their eggs in the compost, the next generation of vine weevil larvae simply never gets going. Vine weevils have established themselves as a serious problem for gardeners, but with vigilance and quick action, they can be controlled – so release those nematodes, and good luck! Do Rabbit Droppings Attract Mice or Rats? Is it Legal to Leave Food For Animals On a Public Path?